Have you ever heard of Raynaud’s syndrome? If you have fibromyalgia, there’s a good chance that the answer to that question is yes. Raynaud’s is pretty common in people who have fibromyalgia, and they can affect each other in some interesting ways. And in fact, some have speculated that the same mechanism that causes Raynaud’s could have something to do with the pain of fibromyalgia itself. But what is Raynaud’s syndrome, how can Raynaud’s be treated, and what exactly is the relationship between Raynaud’s and fibromyalgia? You know that feeling when you wake up after having slept on your hand in a weird way? You know that numb, sort of tingling sensation? The one where your fingers look like they’ve been drained of blood? Well, that’s essentially what the syndrome is. But whereas that phenomenon is usually caused by something (like your body) restricting the flow of blood into the affected limb, in Raynaud’s the body seems to trigger this reaction unnecessarily. Raynaud’s seems to be a result of over-sensitive nerves that respond to normal triggers too easily and dilating your blood vessels, limiting the flow of blood. One of the most common things that trigger Raynaud’s is exposure to cold. Cold temperatures often cause your body to restrict the flow of blood to your extremities in order to keep your vital organs supplied with warmth. But in Raynaud’s syndrome, this happens after a very limited exposure to cold and can last far longer than it normally should. This can make Raynaud’s dangerous. As you probably know, your skin needs a constant flow of blood to feed its cells. When the flow of blood is cut off, as it is in an episode Raynaud’s, the tissue can begin dying. This results in painful sores or even gangrene if the attack goes on long enough. The way that Raynaud’s is usually treated is with medications that increase the flow of blood. That makes sense given that the root of Raynaud’s is a constriction of the blood vessels. So doctors typically prescribe vasodilators to people with Raynaud’s. This type of drug widens the veins, allowing blood to flow through. Perhaps the most famous of these drugs is Viagra. Viagra stimulates blood flow, helping men get erections by opening blood vessels, which of course makes it a good option for treating Raynaud’s. But another option for treating Raynaud’s is with calcium channel or alpha blockers. Both of these drugs work by blocking some of the nerve signals that cause the blood vessels to spasm and close. And you can also get injections of other drugs like Botox that prevent the nerves from triggering this responsible. In addition, a doctor can surgically cut the nerves that control the blood vessels in your hands and feet, thus making it harder for them to close. In most cases, these methods are effective for managing Raynaud’s syndrome. How Are Raynaud’s Syndrome And Fibromyalgia Related? The basic relationship between Raynaud’s syndrome and fibromyalgia has to do with the flow of blood to the muscles. A few studies have suggested that people with fibromyalgia have issues with blood circulation to the muscles. In this study that looked at whether people with fibromyalgia had less blood flow to their muscles after exercise, the researchers found that the fibromyalgia patients had significantly less blood flow into their muscles following exercise than the control group. This suggests that fibromyalgia limits how much blood can get into your muscles, as does Raynaud’s. Now we also know that people with fibromyalgia often develop Raynaud’s as well or have regular Raynaud’s episodes. It could be that the same basic mechanism that causes the lack of blood flow in people with fibromyalgia could also be causing them to suffer from Raynaud’s. Essentially, some have suggested that the same over sensitive nerves that cause your blood vessels to constrict in Raynaud’s are also causing the fibromyalgia pain in your muscles. At the moment, there hasn’t been much research into a possible link between these conditions, so that remains conjecture. And until we know more about what causes fibromyalgia, we will have to chalk up Raynaud’s disease as just one of the many annoying secondary syndromes that come with fibromyalgia. So tell us, do you suffer from Raynaud’s? What do you think of the idea that blood flow plays a role in fibromyalgia? Let us know in the comments. 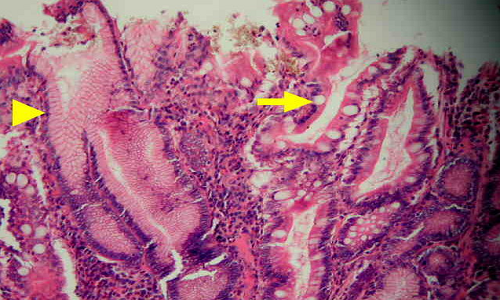 Intestinal Metaplasia And Fibromyalgia : What Are The Symptoms And Risks?